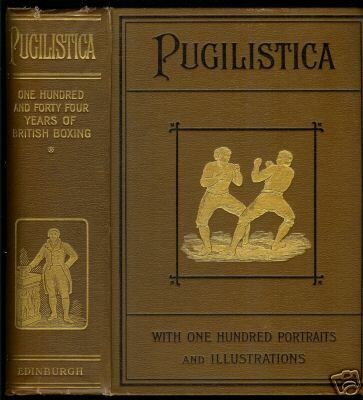 Pugilistica: One Hundred and Forty Four Years of British Boxing by Henry Downes Miles. Three volumes published by John Grant, Edinburgh, 1906. Probably the most complete coverage of British boxing history from Figg (1719) to King vs. Heenan (1863). Over 1500 pages in a three-volume set. Brown leather covers with gilt engravings. Books are complete and in very good condition with no markings or handwriting. This is a difficult-to-find matching set, not disparate volumes.